Lake-view home with Shared Dock! Nestled in the woods with a western view of Woahink Lake, The Huckleberry House is your fabulous vacation getaway for your family or group of 8. With a view of Woahink Lake this sanctuary in tall fir trees is the perfect setting for rest and relaxation. This gorgeous two story, 3 bedroom, 2 bath 2000 sq. 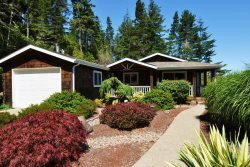 ft. vacation home on 1 acre has a Jacuzzi and a shared dock for those who like to fish and have fun on the lake. Sit out on the deck and enjoy your morning coffee as the sun warms the waters and the lake comes to life. Wind down the day basking in the glows of fabulous sunsets of orange, pink and gold! Relax after a hard day’s play on the Florence Oregon Coast and sooth your soul in the full size Jacuzzi. Located just outside the house, the Jacuzzi offers the perfect vantage point to count the stars and watch for meteors under the open sky. The Huckleberry House is located 5 minutes south of Florence on the quiet eastern hillside of Woahink Lake. Bring your kayaks and canoes and paddle through quiet estuaries along the north shores. Woahink Lake is one of over 27 lakes in the Florence area known for trophy fish. Bring your quads and sand toys and have a fantastic time at the sand dunes just 4 minutes’ drive from the Huckleberry House. Visit Old Town Florence and explore the wonderful bistros, restaurants, galleries, and shops along Bay Street. Just ten minutes north along the coast you’ll find fun in the sun and surf at the fabulous Heceta Beach and of course don’t forget to visit the world famous and most photographed Heceta Head Lighthouse as well as the Sea Lion Caves! The Huckleberry House is located just a short drive from two world class golf courses, the Ocean Dunes and the Sandpines Golf Courses! Bring your fishing gear and go Salmon Fishing on the Siuslaw River! At low tide bring your boots, shovel and buckets and hunt for razor clams. No Boat Needed!! Try crabbing right off the docks in Old Town Florence. For the outdoors person enjoy the many hiking trails in the area and some of the finest scenery around. The Huckleberry House is not a lakefront property, but located just up the hill with a western view of the water. It has shared dock access to the lake with another home that is on the water. IMPORTANT: The shared dock is not on the Huckleberry property and is located a short stroll down the hill from the Huckleberry House. The boat launching ramp and sandy beach, with a swimming area, are located at Woahink Lake Park across the lake from Huckleberry House. There is ample parking for your rig. Full Circle Driveway with plenty of room for up to 6 vehicles and ATV Trailers. Garage is not available.